The life span of a notebook battery is about 1.5 to 3 years, under normal conditions. As the battery begins to die, you need to recharge the battery more frequently because it cannot hold a full charge. Do not expose the battery to high heat or freezing temperatures. Hot batteries discharge very quickly, and cold ones cannot create as much power. Short battery life is more likely to be caused by heat than by charge/discharge patterns. Keep the lithium-ion battery cool. For example, avoid a hot car. Charge often, but try not to fully discharge the battery frequently. This only adds strain. Several partial discharges (regular use), with frequent recharges, are better for lithium-ion than one total discharge. Recharging a partially charged lithium-ion battery does not cause any harm because it has no memory. Older batteries with fuel gauges should be recalibrated once every 30 charges. If ignored, the fuel gauge becomes increasingly less accurate. 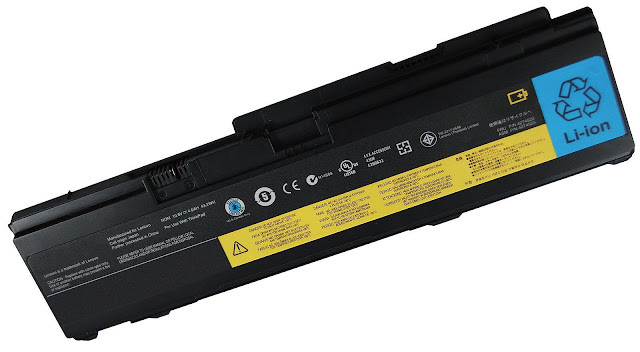 Clean the gold or silver connector on the battery (the part of the battery that makes contact with the notebook) with alcohol or electronic contact cleaner. Cleaning helps maintain good contact, which improves the transfer of power from the battery to the notebook. Do not charge up a battery, and then store it away. A stored battery should be used every three to four weeks. Let the battery fully discharge, then recharge to 40% if you plan to store it again. If you store a battery for longer than three to four weeks, the battery could fully discharge because the battery circuitry itself consumes power. If you have a spare lithium-ion battery, use one exclusively and keep the other cool by placing it in the refrigerator. Make sure that it is wrapped protectively and that nothing will be dropped on it. Do not freeze the battery. Do not use old batteries. Avoid purchasing spare lithium-ion batteries and storing them for later use. Do not buy old stock, even if it is sold at clearance prices. While it makes sense to have 2 or 3 extra batteries, so that you always have a fresh one charged up and ready to go, if you buy batteries and store them for years, they may not work when you decide to use them.